Last month, the Perseid Meteor Shower filled the sky. It was an awe-inspiring sight. It was even better to see — and understand — the show with the help of experts from the Westport Astronomical Society. Volunteers were on hand — as they have been, at least once a week for 40 years — at the Rolnick Observatory on Bayberry lane. A Norwalk resident was one of those who took advantage of the experts. “They were special,” she says. Two were at the telescope inside the dome. Two more were on the platform. They talked about the night sky. They answered questions. They gently quizzed the children who were there. Heroes come in many forms. The Norwalker nominates the members of the Westport Astronomical Society as Unsung Heroes. They certainly are this week’s “stars”! 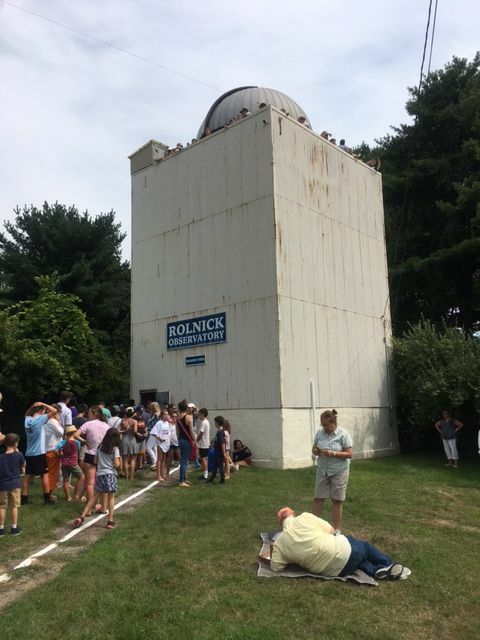 This entry was posted in Education, Unsung Heroes and tagged Rolnick Observatory, Westport Astronomical Society. Bookmark the permalink. This is so nice…. My husband has volunteered there since 1988. Wow, that is 30 years! Enjoy it everyone! Friends and I explored the tower and dome as wee lads, probably early 70’s, when it was abandoned and the ‘Scope long missing. Lowest level was a chain-link fence, then, and the door either missing or barely there, I forget. There was a huge, wobbly wheeled ladder (like you see at Home Depot) to reach the ‘Scope (when it was there). I haven’t been there more than once since it re-opened, Hyakutake maybe. But memory says they added a raised floor to reach the mount now. There was a massive update in 1974-75, and then another in the later 80s(?). Fred Bump from Staple/Bedford was a leader in this, along with some local businesses, including a major optics company along Rt 7. Glad to see it’s still a popular place.